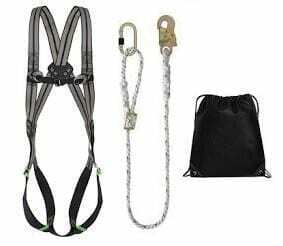 This cost-conscious 2 point basic restraint harness kit integrates a standard harness system with a twisted rope lanyard and a rucksack or kit bag, giving you plenty of value and solid safety capabilities. Our 2 Point Basic Restraint Harness Kit – What is Included? The one-size-fits-all harness that comes with this kit has straps that can be altered to accommodate different users, no matter their measurements. Wearers will be kept safe thanks to the D-ring on the rear, while a pair of textile loops on the chest let you attach other fall arrest lanyards as necessary. The 2 metre twisted rope lanyard that comes with this bundle as standard can be reduced to just 1.4 metres in length, which makes it fairly flexible. Made from polyamide, it is certainly tough and has a minimum breaking strength of 22kN. A steel snap hook makes repositioning the lanyard on another anchor point a breeze, while the karabiner at the opposite end is similarly hard-wearing. If the 2 point basic restraint harness kit is not as comprehensive as you would like, you can browse lots of other options on our site. This includes the luxuriously comfortable 2 point premium kit as well as the super safe 3 point restraint kit. To talk to someone about your restraint kit questions, or for a competitive quote on any of our height safety equipment, call or email Rope Services Direct. Visit our contact page for details of our email form, or phone us on 01384 78004 and get expert advice. 2 Point Basic Restraint Harness Kit Overall rating: 5 out of 5 based on 6 reviews.